“Now we are in the process of concluding the installation campaign for the first phase of construction of Johan Sverdrup. Putting the final building blocks of this gigantic project into place is important to ensure start-up of the field as planned in November this year,” says Trond Bokn, senior vice president for Johan Sverdrup. The two final platform topsides were installed using the heavy lift vessel Pioneering Spirit’s single lift technology. The processing platform lift – nearly 26,000 tonnes – set a new lifting record offshore, and was carried out on Tuesday morning in only four hours with a clearance of just 25 metres from the rest of the field centre. The lift of the utility and living quarters topside, 18,000 tonnes, was completed early Friday morning in just 3.5 hours. 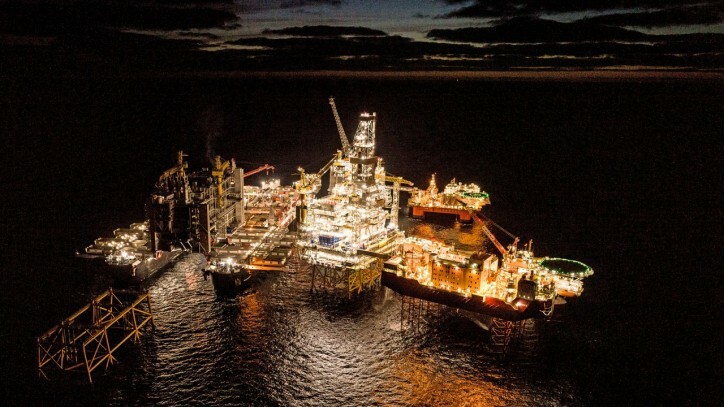 From the start of the lifting operation of the processing platform on Tuesday morning until the living quarters topsides had been lifted into place on Friday it took less than 72 hours. During the same period, the final flare stack and the bridge that links the processing platform to the drilling platform were lifted into place by the heavy lift vessel Thialf. The final bridge that will connect the utility and living quarters topside to the rest of the field centre will be installed in the next possible weather window. The installation and completion phase offshore at Johan Sverdrup started with installation of the jacket for the riser platform in August 2017. After that, an additional three steel jackets, four topsides, two bridges, two flare stacks, 200 km of power cables, and more than 400 km of pipelines have been put in place. More than 2000 vessel days associated with installation and marine activities have been carried out so far, without serious harm to people or the environment. The first item on the agenda is hook-up, testing and commissioning of the two final topsides. This will be followed by testing and ensuring that all four platforms – and the field centre as a whole – function as a single unit. Completing the tie-back of the eight pre-drilled production wells on the field to the drilling platform will also come in addition to this.